In Far Eastern astrology, the White Tiger is a supernatural figure who presides over the Western, or autumn quadrant of the sky. The spirit of the White Tiger combines the courage and fierceness of a soldier with an ethereal, magisterial dignity. In ancient times, the head of the White Tiger graced the shields of soldiers going into battle, the entrances to important fortifications and the bows of the Emperor's fastest ships. To wear the symbol of the White Tiger embroidered on ones robe was indicative of high rank among military officers. In the ultimate tribute, the title of 'White Tiger' was bestowed upon Yin Chen-Hsin, a canonized general by the last Emperor of the yin dynasty. The general's image is found on the entrance of all Taoist temples to this day. The mystery and mythology surrounding the White Tiger continued unabated for centuries. Its likeness was frequently painted on sanctuary walls to frighten away demonic, evil spirits. White tiger images pervade the remaining temples and structures of the famous Shogun dynasty of Japan. The White Tiger's hide of white with dark brown stripes provides near perfect camouflage during the hours of dawn and dusk, the hours during which he/she is most likely to hunt for food. Being thus endowed, the white of the tiger appears to the eyes of potential prey, to be innocuous areas of sunlight in the forest or jungle, while the stripes provide the illusion of shadow. Thus, it is believed that this is a spirit that dwells in both the world of darkness (physical realm) as well as that of the light (spirit realm). One who is blessed to have White Tiger walk beside them, is here with the Role to Seek Personal Truth. Yet in order to thoroughly understand and absorb the lessons and responsibilities of this role, White Tiger Soul need first acknowledge the shadows that exist Within. The shadows that are represented by the dark stripes of the White Tiger, may be in the form of beliefs or behaviors which bring pain either to the Self or to Others, fear turned inward, which ultimately manifests as hatred or anger, or Untruths which he/she has borne, either through the act of omission or the direct voicing of Untruth. Yet the challenge here is acknowledgment and the facing of Personal Truths free of judgment, self retribution or placing the "responsibility" onto another. Instead, true integration and acknowledgment of Personal Truths comes from accepting what is revealed with an open and understanding heart, while operating with the Higher Intent to change what is ultimately harmful, painful or no longer of service to the growth of the individual soul along its Life Path. 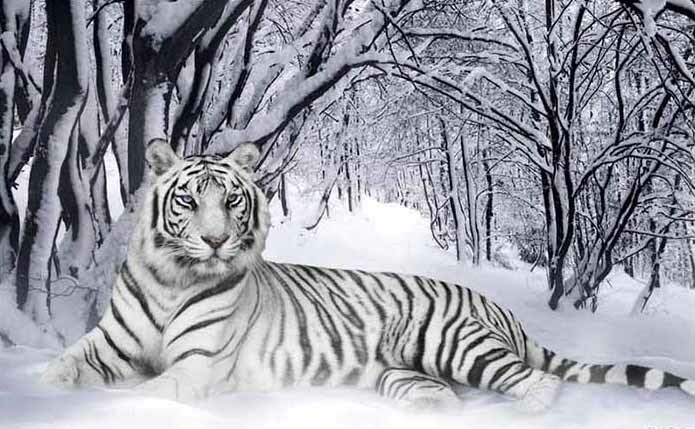 Once this self-examination and soul level ~cleansing~ has been accomplished, White Tiger Soul may then become the gleaming example to his/her fellow two-legged of the gift and beauty of operating from Personal Truth. White Tiger is drawn to a soul that has a powerful sense of conviction and inner strength. Therefore, one who is blessed with this Power Totem will have strong ideas of what is "right" and "wrong," and will stand by this personal belief system, even if that means leaping in the face of popular opinion. Regardless of whether White Tiger Soul is operating from Higher Intent or Contrary Medicine, these individuals will be well known for their outspokenness and strength of conviction. They are here to teach us the importance of knowing ones inner values and beliefs, and to instruct us to align the way in which we walk our Path so it is in keeping with our belief system. When one chooses to operate from the higher vibration of White Tiger, an impassioned voice may be raised as an advocate for Balance and Acceptance, a Teacher of Fundamental Philosophy might be born, or a Leader may emerge to guide the way along the path of Universal Truth.